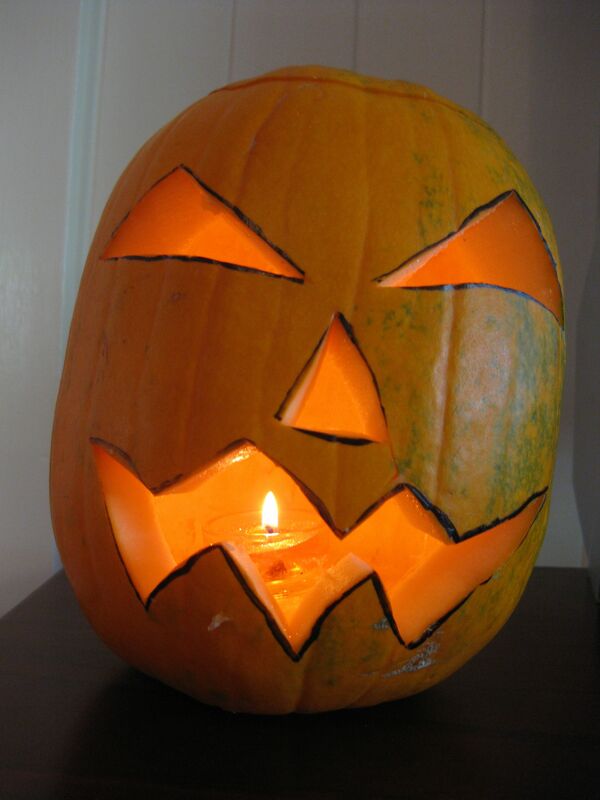 Using the right pumpkin makes the job EASY! 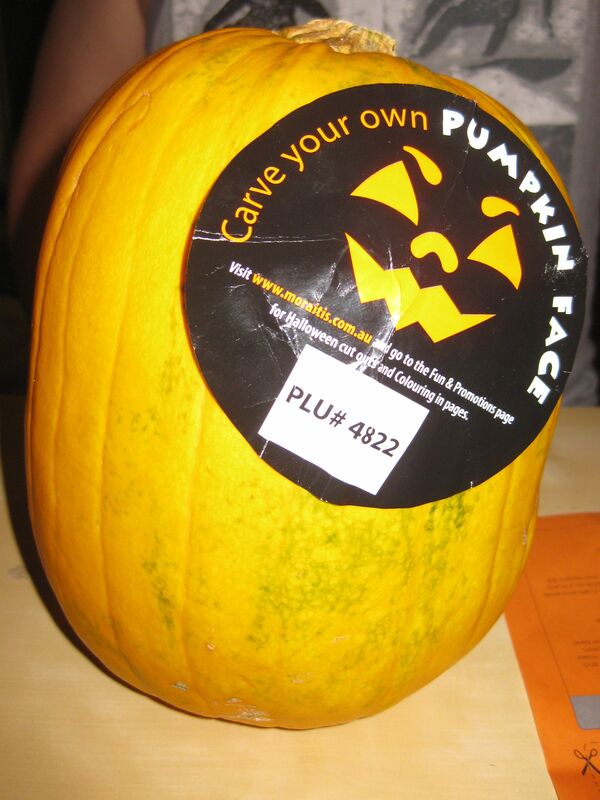 Brisbanites frequenting supermarkets have started encountering big, overpriced, yellow pumpkins just lately. I took it upon myself to see what all the fuss was about. In the name of craft and open-mindedness, I put aside my reservations about ‘celebrating’ Halloween, to see whether these pumpkins were anything special. 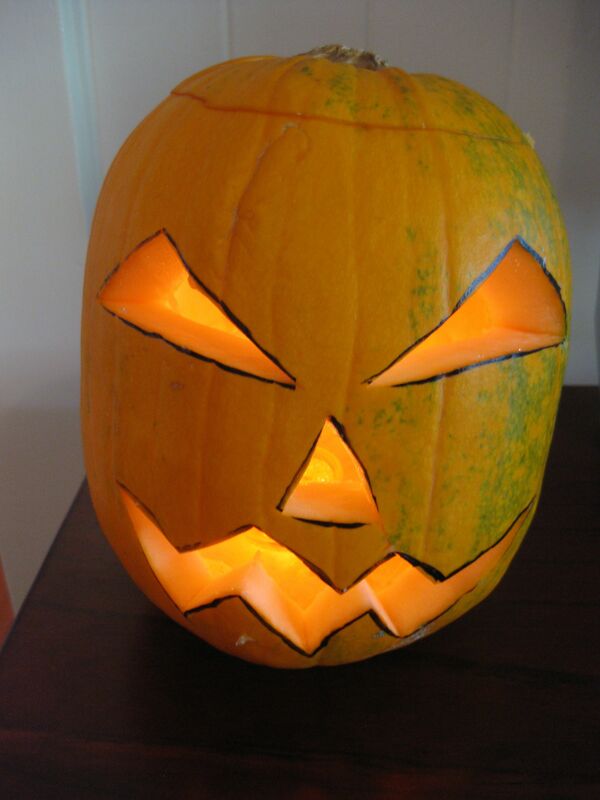 To be honest, I’d wondered how hard it would be to carve one up, given the near brute force needed to cut up our typical Butternut pumpkin for dinner. In short, it was as easy as falling off a log. Using the right kind of pumpkin makes all the difference. 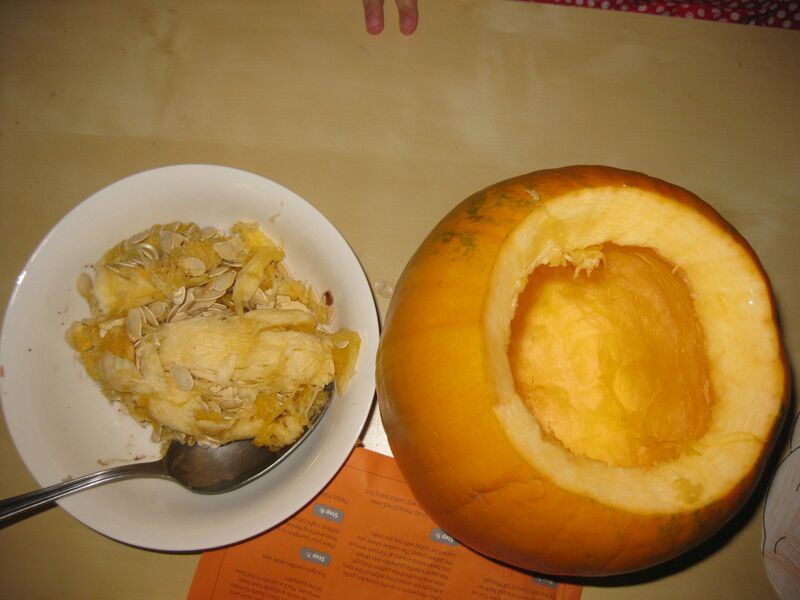 As you can see from the photos below, it’s a softer pumpkin which has a lot of ‘guts’ that’s easily scooped out by little kids. The cutting must be done by an adult (obviously, one would think). The supermarket instruction sheet sets out 8 steps, but really, there are only five, tops. To be clear, the hairy fingers in the photos are not my own. Yours Truly suffered a shoulder / neck injury while sleeping (how sad is that?) and couldn’t operate the knife without screaming like a banshee, so Dear Brother did the honours. 1. 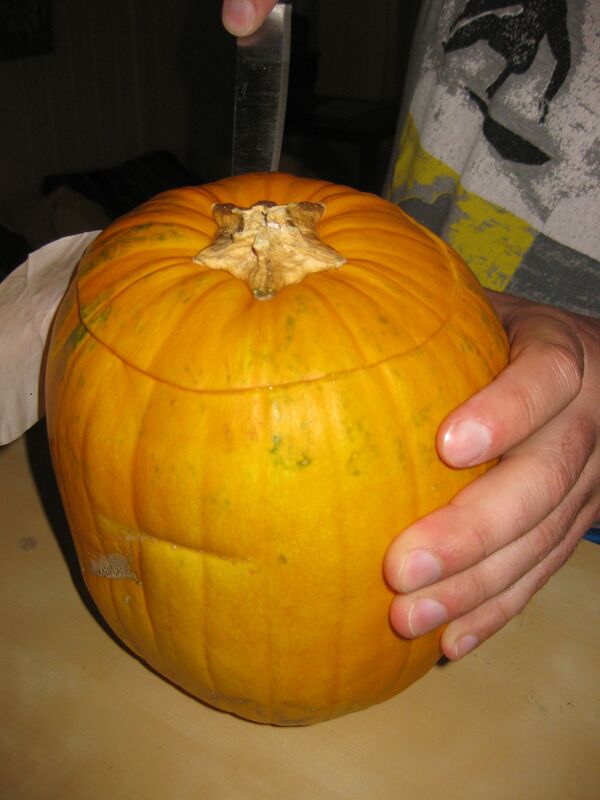 Carefully cut the top off using a knife (operated by a competent adult). 3. Draw a face with a permanent ink marker or mark the outline of a face with pins (eg. using a template). 5. Insert a tea light candle and light it. 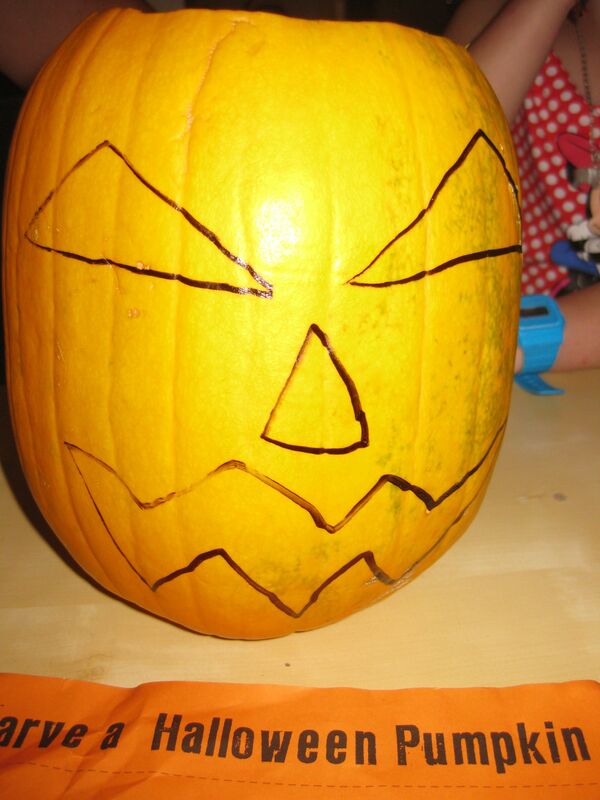 Carving up a pumpkin and having a bit of dress-up fun at home is one thing. But if you are taking kids out for trick or treating, do keep in mind the contradictory messages (Don’t take lollies from strangers, except on Halloween. Don’t be mean, unless the neighbours don’t give you sweets. Bullies are bad, except on Halloween.) which can set you up for trouble down the long and winding road of parenthood. While you might be going with them this year, there’ll come a time when they’ll think it lame that their parents tag along (and by that stage, they’ll be too big to say “No” to, with any sort of moral authority). And please don’t kid yourself that children in a group are safe. Sometimes, a group is the most dangerous place to be. 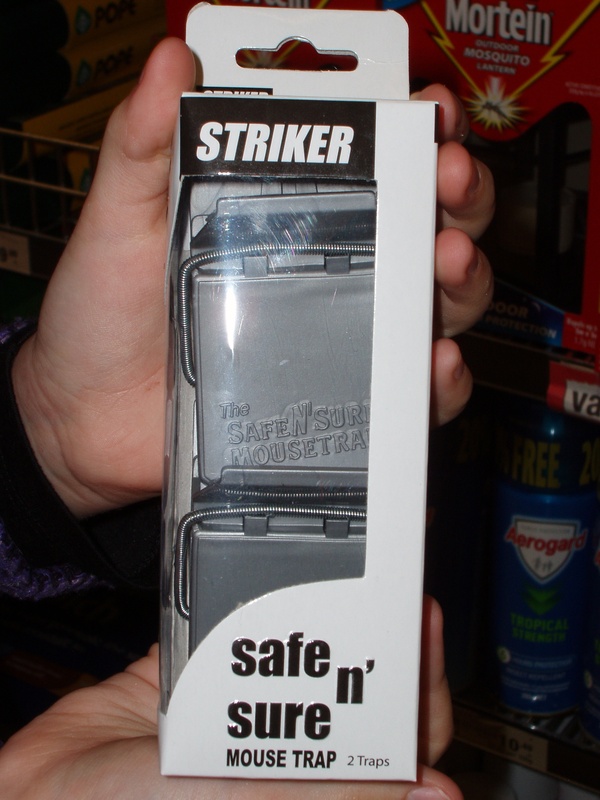 Keeping kids safe is hard work. In a perfect world, there would be no begging for lollies (as opposed to nuts in days gone by, in preparation for winter), but if it must be done, then perhaps consider door-knocking just your friends and family and by prior arrangement. 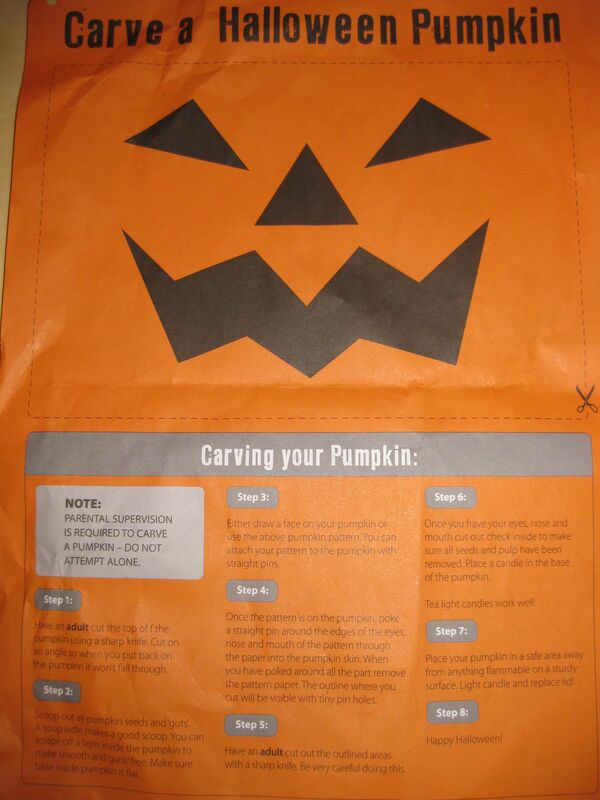 Don’t freak out the elderly, or people who don’t understand or want to have Halloween thrust upon them. Realistically, anyone opening the door to strangers on Halloween is crazy, even if it’s a little kid standing at the screen door (who’s standing behind him?). A bit of consideration goes a long way in not only keeping good neighbours, but in keeping EVERYBODY safe. Go look up some statistics about how many kids go missing on Halloween overseas. Ask your friendly police how many assaults happen and how many complaints they clock up. Fun should never be at the expense of others. And this is the end of the government, anti-fun policy. Have fun, responsibly. And regardless of your religious beliefs, think about the dearly departed on 1 November, which is what it’s all really about. UPDATE: To avoid being gouged on the price of a Halloween pumpkin, try using a watermelon – it does work and you get to eat the insides. 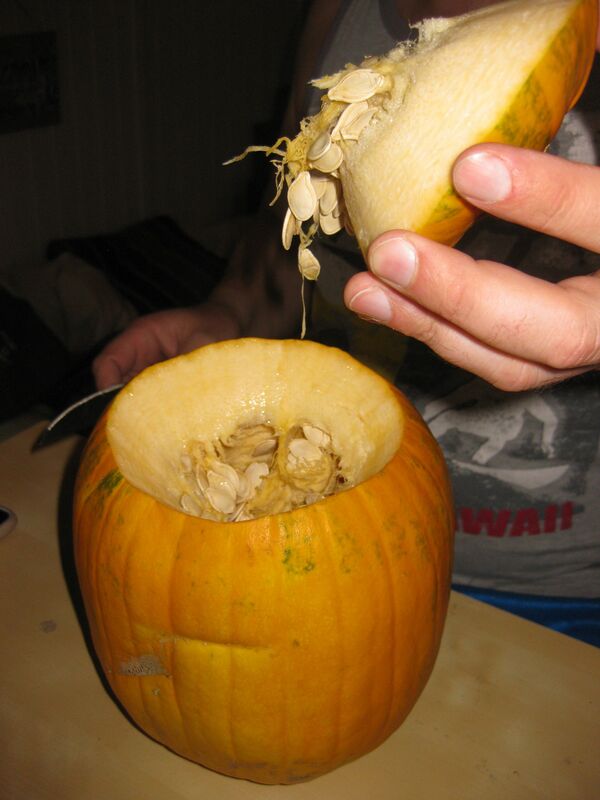 The Halloween pumpkin isn’t good eating. 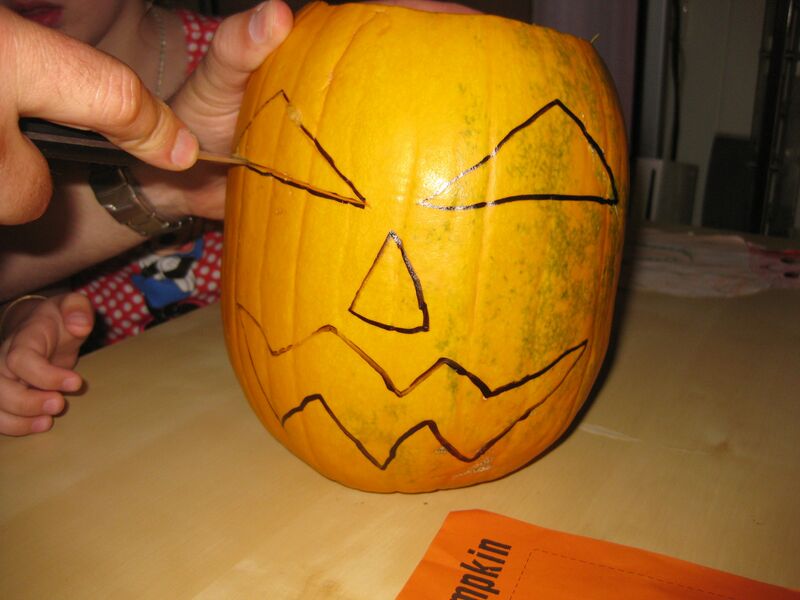 See my later post with photos of a Halloween watermelon, thanks to the Auntie-who-thinks-of-everything. The Auntie-Who-Thinks-of-Everything alerts Yours Truly to a new trend, that’s sure to work its way to the outer sleepy suburbs…. Here’s the inside with some bits tucked in for size demonstration purposes. 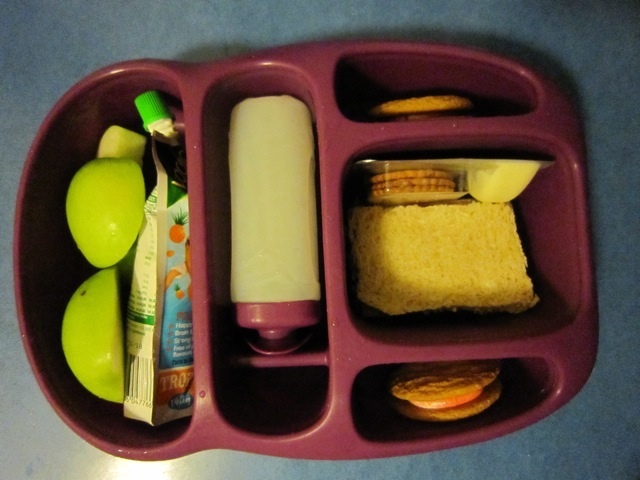 It easily fits a regular sandwich, fruit, crackers & cheese and the rest. Check out the Goodbyn or Biome website for more. 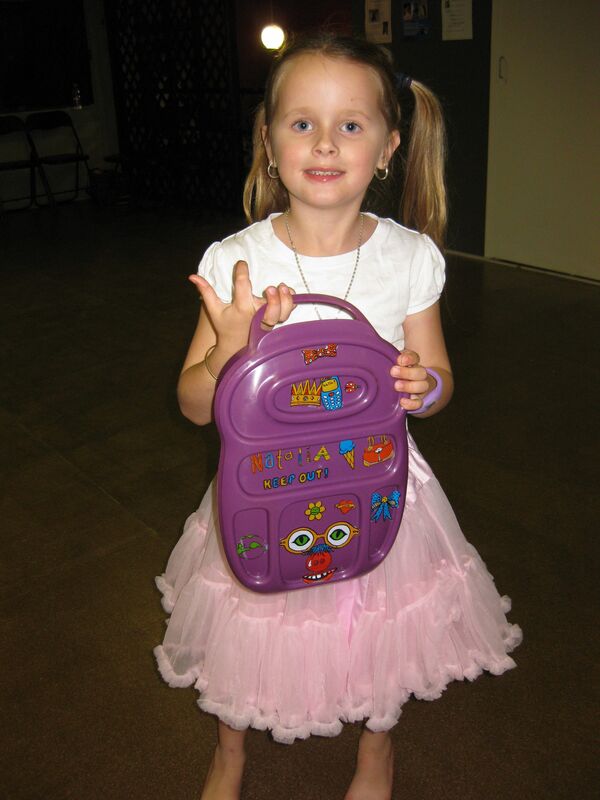 Inner city Brisbane schools are abuzz with the latest in cool kids’ lunch boxes. Word on the street is that kids are loving the Goodbyn lunch boxes from the USA, but which can be bought in Australia from Biome. What’s to like, with just another pile of plastic, you wonder. * a percent of sales goes to environmental causes. * once you’re hooked, you’re hooked. The adult version of the Goodbyn doesn’t have the big lip / ear for easy opening and comes in more sedate colours. It’d be great for taking leftovers to work, be it curry and rice, salad, fruit salad and yoghurt or dip and veggie sticks. Perhaps other stickers would be required for adults. Here’s one I thought of: Think Big, Eat Small. Or, Would You Like Chocolate With That? Apparently, you can put yoghurt or dip into one compartment, without it spilling into others. This is pretty nifty. In terms of liquid tight seals, the only other brand I currently know and trust is Tupperware (Tuppercare Snack Cups & Everyday Bowls, Fuel Pack & All Day Pack for babes). But, I haven’t seen anything in the configuration of the Goodbyn. Having it all in one, does seem convenient. I don’t own one (because I’d just been to several Tupperware fundraisers…) but I’ve seen it in action. 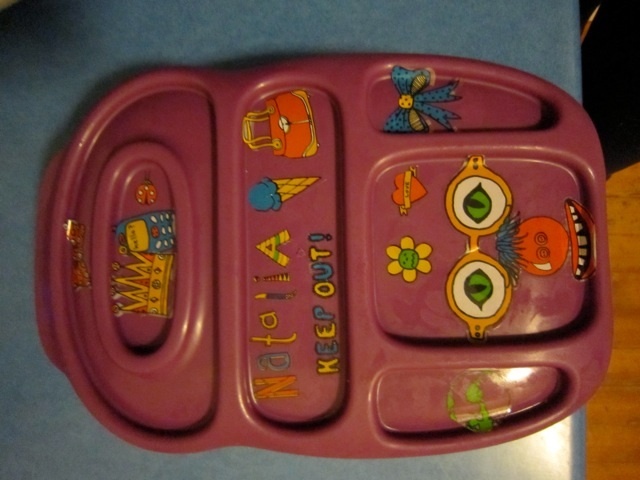 My niece gets on with her new lunchbox very well and in the end, that’s what matters – making lunches something children look forward to. Everything else is a big bonus. Anything that makes good parenting easier gets my tick of approval. So, this week, while you’re filling out school book orders for next year and probably wondering how many weeks are left till Christmas, you might want to contact Santa for a Goodbyn stocking filler. Yours Truly gets a little bit excited when a product actually lives up to its marketing hype. I can say that I was hugely impressed with the fact that these tomatoes didn’t turn into sandwich sludge – not even when put in the toasted sandwich maker (aka jaffle maker). They hold firm and seem to last longer than other types of tomatoes, when kept in the specially designed holey plastic bag, in the crisper section of the fridge. The tomatoes cut very easily (even with my perpetually blunt knives), present very well and taste great. No more mushy tomato sandwich nightmares. Enjoy! 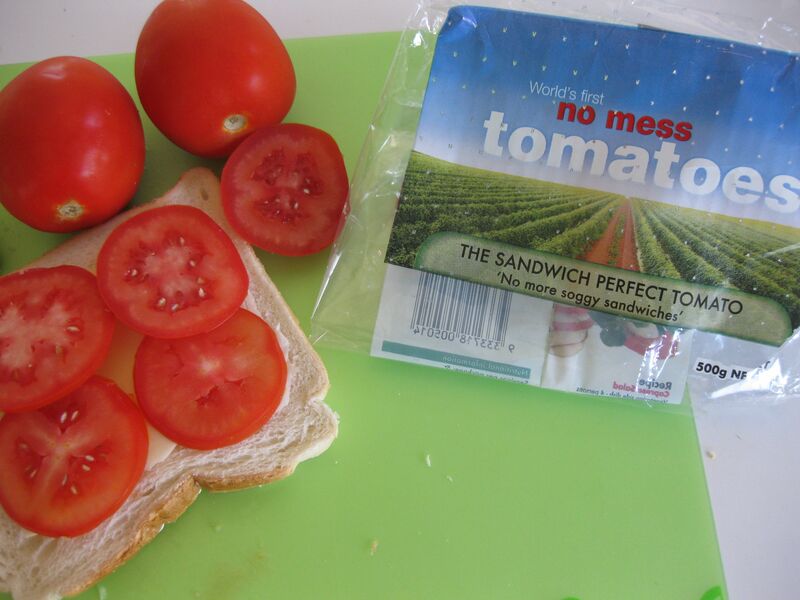 No Mess Tomatoes, indeed! UPDATE: I’ve had buckets of people agreeing that these are now their favourite tomatoes! I love a local good-news story. Hats off to Aussie ingenuity. 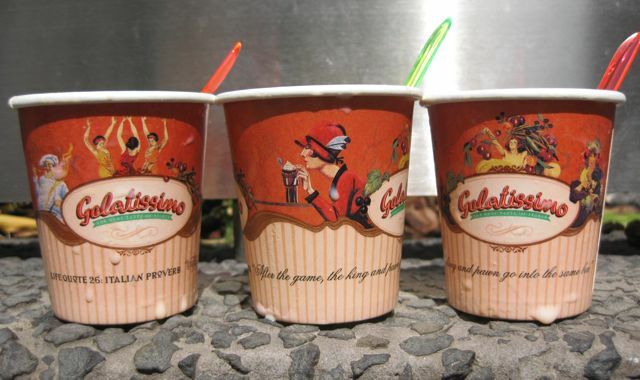 I love the Italian proverb on these gorgeous little ice cream cups: After the game, the king and pawn go into the same box. Says a lot. What I loved even more was the ice cream itself. Miss Six had American Chocolate – which we all enjoyed. I had Pistachio – which we all enjoyed. Miss Nine finished her Carmel & Hazelnut Gelato before I could introduce her to the joys of taxation (‘Mama Tax’). Have a great Friday! If it’s not so great, ice cream helps…. Craft is something that other people do better than me. I’m mostly appreciative of other people’s efforts (although please don’t send me any toilet roll dollies) and I know a winner when I see it. With thanks to readers Lee (for the colouring kit) & Joanna (for the purse-sized notebook). For some reason, people ask me for makeup advice, not realising perhaps, that for me, if it doesn’t go on in 5, it doesn’t go on at all. I like makeup that is easy, not obscenely expensive and doesn’t cause my skin to react. 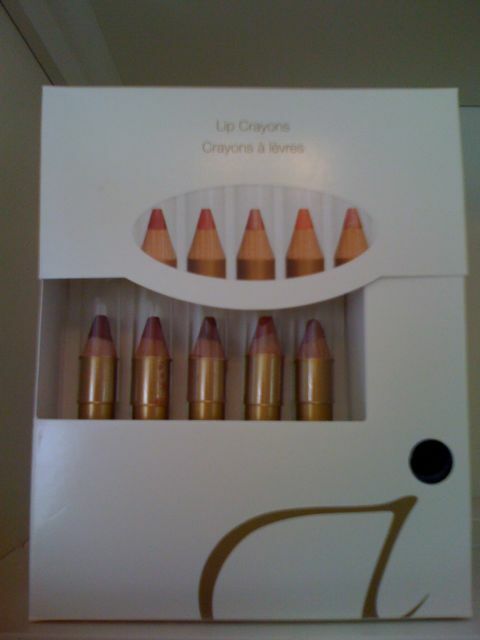 One of my favourite products (and one of the few things that I don’t react to) is Jane Iredale’s lip crayons. * they blend ie. you can put one colour down and then another over the top of it to get the exact shade you need – or you can put coloured gloss (I like Iredale’s glosses as well) over the top. They also go on fast, with no fuss – so they get my big tick. Brisbane ladies can look up my fav supplier, La Bella Sophia Hair Nails & Beauty, and speak with Deb.